In the life of most bands, touring begins well before the financial ability to do so comfortably – never mind glamorously. The cushy guarantees that enable Sprinter vans and separate rooms at a 3-star hotel are a ways off, at least. But touring is fun, and even if it weren’t, it’s necessary to spread the word. The Minutemen knew this, and famously determined to “jam econo” on the road. To them, this wasn’t an ascetic self-denial; it was a way of doing what they loved in a way that was appropriate to their station as a weirdo post-punk band without a lot of resources. It was doing what they could with what they had. And no matter how un-weird or destined for the mainstream you are (or think you are), to jam econo is to place your music at the center of touring, and that should always be the point. Here are five easy ways to jam thusly. 1. Download an app for your phone such as Gas Buddy, enabling you to find the cheapest gas prices around you at any point on the road. It might not seem like much to save 12 cents per gallon, but over the course of a month-long tour, this could be the difference between turning a profit or not – especially if your van isn’t particularly eco-friendly with the MPG. For more recommendations, check out our list of must-have apps for touring musicians. 2. Get someone back to the merch table immediately after you play. Most bands don’t sell tons of records and T-shirts on tour, but, like the price of gas, it adds up – and if there’s no one at the table, people can’t buy any of your stuff. If you’ve got a friend who likes going on road trips and can stand the sound of your band night after night, bring him or her so that someone can be at the merch table while you’re playing. 3. Sleep on floors and couches whenever possible. Know someone in the town you’re playing? Hit them up! Put them on the guest list for your show and crash at their place later if you can. If you don’t know anyone, ask someone in one of the other, possibly local, bands. Or, just ask someone that seems nice if they know of a place. You can even "crowdsource" it via Facebook or Twitter. You’ll stay with some strange people (so be somewhat careful), but that’s part of the fun. And of course, bring sleeping bags. 4. When you can’t crash at a house for free, get a cheap motel (or a decent hotel/inn on Priceline) and cram everyone in the same room. 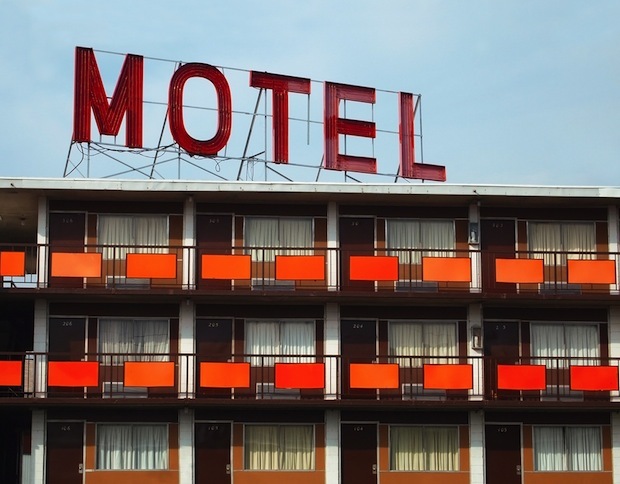 For some reason, motels charge per person, not per bed. Send one person from the band in to get the room at the one-person rate, and since most motels don’t require you to pass through the lobby to get to your room, you can then get the whole band in the room without the person at the front desk knowing. (Editor’s note: Sonicbids doesn’t necessarily condone this, but let's face it – nearly every band does this when they're strapped for cash.) You can also search apps like Priceline for hotels in the area that are running discounts on rooms they haven’t been able to rent that day. This is another place where sleeping bags can come in handy (sometimes there just aren’t enough beds for the whole band). 5. Shop at grocery stores for bulk items instead of eating at restaurants. Pick up stuff like bread, peanut butter, big cases of bottled water (drinking lots of water on tour is a must), etc. It’s up to you how extravagant you want to get here, but it will still be cheaper than eating every meal out. Fast food might seem cheap, but it adds up, and makes you feel terrible after a few days. Remember, you’re going on tour to play your music to new people, see new cities, and of course, have fun! And the good news is that none of that requires lots and lots of money. If you go out there with a realistic, frugal mindset, you might just come back with a profit on your first tour. For a close look at this way of touring/music-making writ large, read Michael Azerrad’s definitive indie document, Our Band Could Be Your Life.